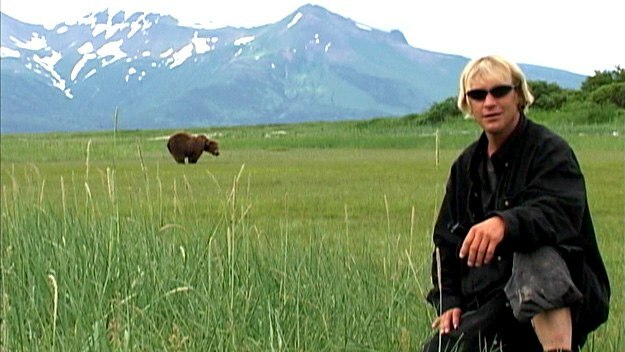 ‘Grizzly Man’ is engaging and insightful, but Timothy Treadwell was just a neurotic pursuing a self-serving endeavour. This well-crafted, insightful documentary reveals a damaged, narcissistic and complacent man who found solace in the wilds of Alaska. Contrary to what I anticipated, ‘Grizzly Man’ is first and foremost a character study; the man is discussed far more than the beasts he surrounded himself with. From the onset, I was surprised by Timothy Treadwell’s eccentric demeanour; I was even more surprised by how quixotic and naive he was. Treadwell had been both an alcoholic and drug user prior to his Alaskan adventures, and it seemed as if he was still hitting the bottle during his rambling, gushing monologues about his love for the animals and the immense passion he had for his mission of ‘protecting the bears’. The main problem with Treadwell was that his objective was irrelevant and aimless; the bears weren’t really under any threat. Indeed, an interviewee spoke about bear culls, an activity which I admittedly didn’t see any purpose in, but these culls didn’t affect the stability of the population. Overall, Treadwell’s apparent love for bears was a self-serving endeavour; he was never going to improve the bears’ quality of life, but the bears certainly improved his. The problem with the film is Timothy Treadwell, it’s hard to resonate with the man due to his foolishness and juvenile manner. Treadwell became increasingly conceited throughout his footage. His complacency reached its zenith in an almost comically ironic segment recorded hours before his death where he proudly stated how he had reached a point of untouchability with the bears; it summarises just how detached from reality he was. This is another of Werner Herzog’s accomplished documentaries, however it is Treadwell’s flawed, rather unlikeable personality that makes it one I won’t watch again.